Hi Guys! A few days ago I went to Target after work. I absolutely love Target and can always find so many good things to buy or look at. I went there for a specific purpose. I had seen two products on beauty guru reviews that are NEW and looked interesting to me. 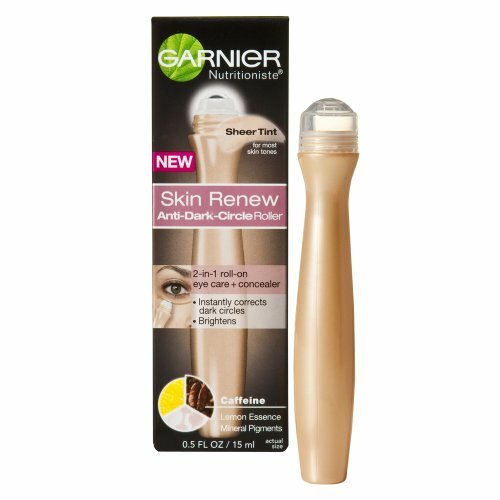 The first is the Garnier Nutritioniste Skin Renew Anti-Dark Circle Roller (with a tint). This product comes non-tinted as well and when I saw the one with concealer I knew I had to try this one! It's an eye treatment for tired puffy eyes plus it has concealer that will lighten dark circles under the eye. A perfect pick me up! So, I've been using this the last two days and I'm SO impressed. I used it after work one day when my eyes felt tired and it instantly brightened them and the concealer lightened any dark pigment under the eye. It was just like I had thought... an instant little pick me up! Now, I use it right away in the morning when I'm still kinda tired...and also one throughout the day if I need a little extra something. I will probably talk about this again or do another review. I love it so far! The second product I picked up was the: John Frieda Sheer Blonde Go Blonder Lightening Spray. And, I have a confession to make. This was sold out in my first Target trip. I went to Ulta the very next day and they were sold out too. So, last night, I went to Target (a different one) and they had two left!!! I was so excited to finally find it because I have heard that this is great for dark roots...as your blonde hair grows out. I have not tried it yet. But, I will let you know my thoughts once I have an opinion.